Honda’s flag-ship V4 sports-tourer is powerful, refined and has a classy feel, though it’s also heavy and lacks the agility and electronic sophistication of some rivals. That’s unless you count the VFR1200FD model’s Dual Clutch Transmission system, which was updated to good effect in 2013. 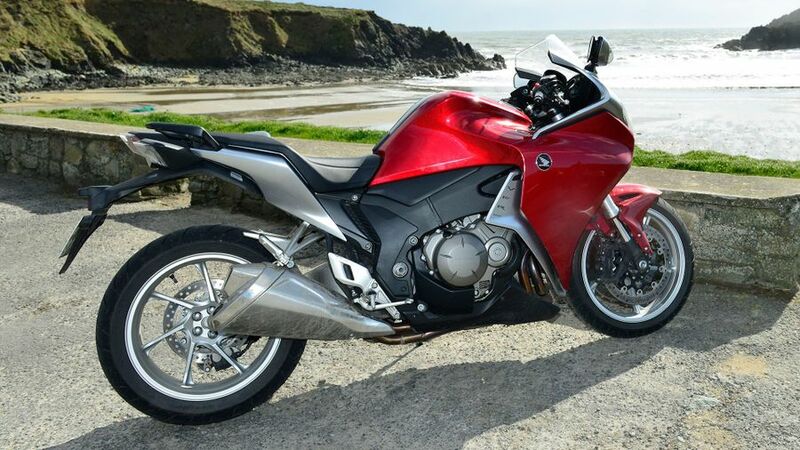 Interested in buying a Honda VFR1200F? The VFR1200F has been with us since late 2009 but it still manages to look stylish and exceptionally well finished. Its outstanding styling feature is arguably the twin-layered fairing, which allows air through slots on either side of the headlight, directing it along the bike beneath the outer layer. Paint finish is of notably high quality, and neat features range from the way the front indicators are cleanly integrated into the mirrors, all the way to well-designed pillion hand-holds. But the screen is not adjustable, and why Honda saw fit to reverse the positions of horn and indicator buttons remains a mystery. The VFR’s distinctive look was not universally admired on its launch but five years on it has aged very well. The VFR’s look and riding position are distinctly sporty by sports-tourer standards, which has arguably held it back as many potential customers riders have opted for more relaxed bikes including Honda’s own Crosstourer, which uses the same engine. It’s a fairly long bike, so you lean forward slightly to the raised clip-on bars. Honda’s work to keep the engine narrow means the VFR feels slim, and there’s plenty of legroom. The seat is fairly high, at 815mm, and wide where it counts for comfort. But it’s narrow at the front, so the VFR is respectably manoeuvrable despite a hefty fuelled-up weight of 277kg. 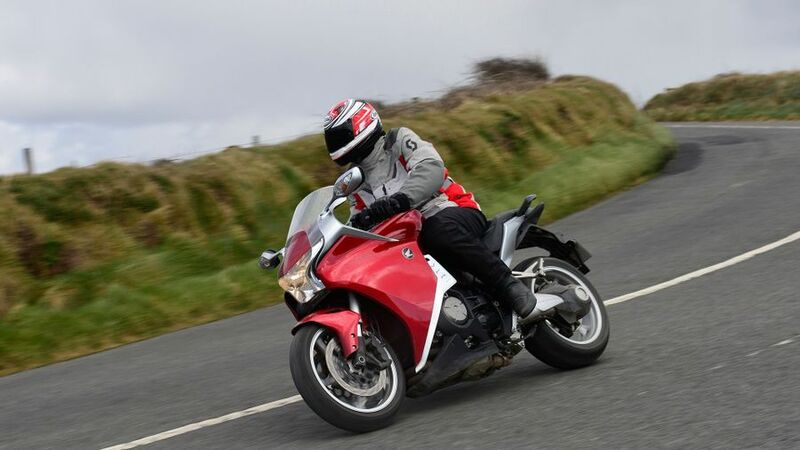 Sports-tourers are intended to be as versatile as they’re fast, and the VFR makes a good but not outstanding job of the practical side of the equation. It’s definitely a bike that you can ride all year round, for everything from commuting to touring, though its size, weight and riding position mean it’s less than ideal in town. It scores points for build quality, high-speed comfort and shaft final drive, and is effortlessly capable of carrying luggage. But although Honda enlarged the tank slightly after the original model’s 18.5-litre capacity was heavily criticised, you’ll still do well to get more than 150 miles from a tankful. The VFR is powered by a 1,237cc, liquid-cooled “Uni-cam” V4 that produces a hefty 172bhp along with plenty of midrange. To save space, the cylinder angle is not 90 but 76 degrees, with the two rear cylinders on the inside of the four for reduced width. There’s plenty of low-rev torque on tap, even with 4,000rpm or less showing on the centrally placed analogue tacho. The sweet response of the VFR’s ride-by-wire throttle helps make the Honda very controllable, and with 172 horses on tap it’s certainly not short of speed. It’s effortlessly capable of 150mph plus and has a pleasant V4 character, though some riders find the vibration at higher revs annoying. The low, fixed screen means pilots of most heights will suffer from turbulence at cruising speeds well below that. On its launch in 2010 the VFR was the first Honda to be available with Dual Clutch Transmission, which has since gained in popularity and is available on several models apart from the VFR1200FD. The system — which offers fully automatic changing or manual via a paddle-shift system with left index finger and thumb — has been improved, too. In auto mode it now allows the rider to override the automatic modes temporarily, for example by adding an extra down-shift before a bend, before reverting to automatic. DCT works well if you’re riding gently but even S mode, the sportier of the two automatic options, is too soft and rev-shy for fast riding, tending to change up too soon when exiting bends. The system also tends to be conservative with its down-shifts, frequently entering a turn in too high a gear. At least DCT now works well in letting you downshift with a flick or two of left thumb, before resuming auto changing on the way out. The system also has a built-in auto-blipper, to smooth down changes. This version of DCT works well enough that it’s easy to understand why some riders like it, though it’s still not optimised for sporty riding. Braking is fine. 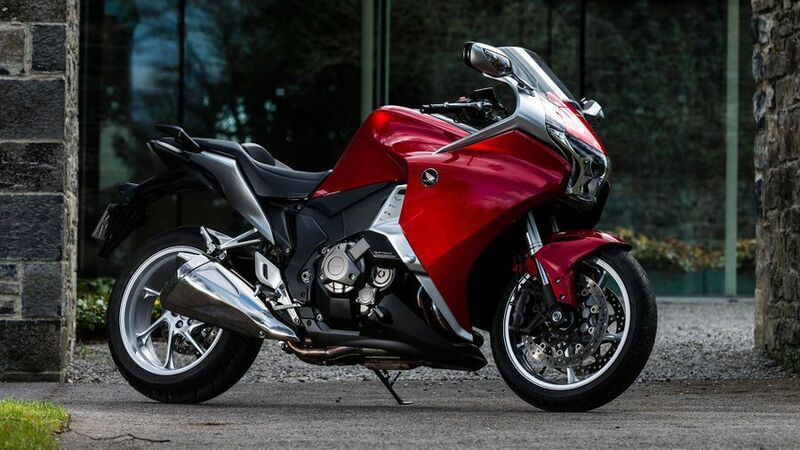 The VFR doesn’t get Honda’s electronic ABS, as fitted to the Fireblade and CBR600RR, but its linked disc system is powerful thanks to six-pot front Nissin callipers, and the conventional ABS is typically efficient. 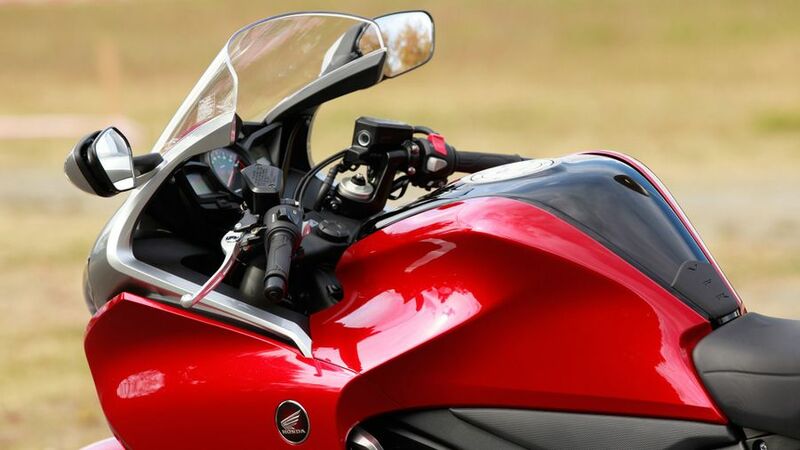 There’s no doubt that the VFR is a big, heavy bike but it handles very well, combining high-speed stability, neutral steering and even the ability to change direction respectably quickly and with great precision, provided you put enough input through the relatively narrow bars. It certainly holds its line well, giving a reassuringly accurate feel in bends. The suspension specification is Stone Age by comparison to rivals with semi-active set-ups, comprising just preload-adjustable 43mm forks and a rear shock that has remote preload and rebound damping adjustment. But despite that the Honda’s ride quality is good, and the 120mm of front and 130mm of rear travel is well controlled. If you weren’t aware of other bikes’ superior ease of adjustability, you probably wouldn’t miss it. As always, fuel consumption depends to a large degree on how much and how often you open the throttle. A typical average among owners is a respectable 45mpg, with a broad range of riding styles meaning that this can go up or down by 10mpg. 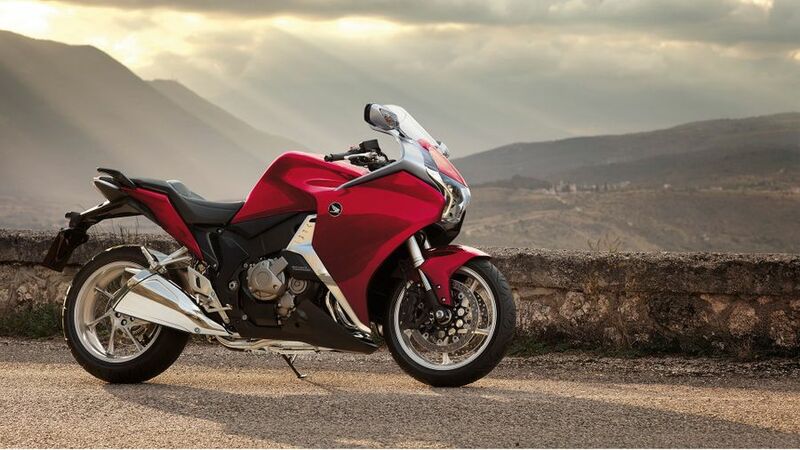 The VFR1200F and FD are so reliable, that they are the only two Honda bikes to get a three-year unlimited mileage warranty, rather than the normal two years. But, it's a relatively big, heavy bike, so it's bound to use tyres and brake pads at a fairly brisk rate, but its shaft final drive is one cost-saving area. Service intervals are average at 8,000 miles minor; double that for valve gear inspection. For a flagship model the VFR isn’t particularly well equipped, conspicuously lacking some rivals’ adjustable screen, multiple riding modes, comprehensive instrumentation and even standard fitment panniers. But it does now have a traction control system, and in most respects the basics, such as mirrors, seat and controls, are very good. An adjustable wind deflector for the screen features in the accessory list, along with hot grips, centre-stand and hard luggage. Honda’s attention to detail shows in the panniers and top-box, which aren’t the biggest but fit neatly without needing ugly brackets, and have built-in flex in the mounts to counter high-speed instability. The VFR1200 hasn’t quite hit the spot in the way that the best of its forebears did more than two decades ago. It’s fast but too heavy to compete with sports bikes, can’t match the more laid-back comfort of a typical adventure bike, and lacks the image and cutting-edge details of its top sports-touring rivals. The Honda isn’t cheap, either, costing £13,599 for the FD or £12,999 for the non-DCT F model. But for riders who still want a powerful, fairly sporty but still comfortable, long-legged machine to ride serious distances at speed, the VFR has plenty to offer. And if you like the idea of Dual Clutch Transmission, the FD in particular is worth a closer look.